Did you know most Americans get the recommended amounts of protein to meet their needs? However, majority of protein consumption is from animal sources and has a high fat content. Because different protein sources give us different vitamins and minerals, it is important that vary our protein intake. The protein foods group is comprised of both animal and plant sources. All foods made from meat, poultry, seafood, beans and peas, eggs, processed soy products, nuts, and seeds are considered part of the protein group. Protein is even found in dairy. Protein is a component of every cell in the human body and is necessary for proper growth and development, especially during childhood, adolescence, and pregnancy. It helps your body build and repair cells and body tissue and is a major part of your skin, hair, nails, muscle, bone, and internal organs. It is also important for many body processes, such as blood clotting, fluid balance, immune response, vision, and production of hormones and enzymes. The Healthy U.S.-Style Eating Pattern recommends 5½ ounce-equivalents of protein foods per day at the 2,000-calorie level. 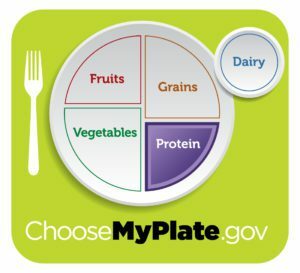 This eating pattern also suggests weekly recommendations for the subgroups: seafood; meats, poultry, and eggs; and nuts, seeds, and soy products. Learn more about our nutrition program hereprotien.